As a blogger who loves kids crafts and activities, I am a huge fan of collecting books with creative ideas. It is rare that I find a book that is filled with cool ideas that is also inspiring, thoughtful, well-written, and filled with gems of wisdom. 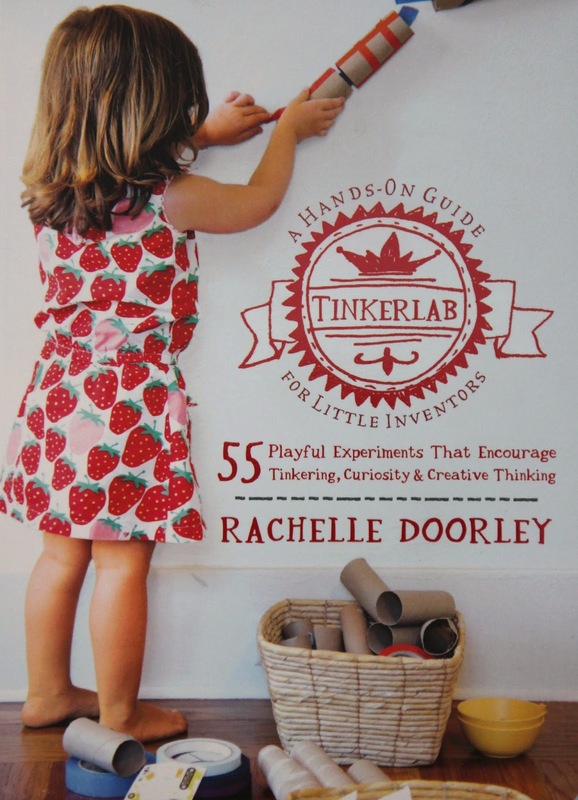 Tinkerlab: A Hands-On Guide for Little Inventors by Rachelle Doorley arrived in my mailbox a few weeks ago and fit the description above perfectly. I haven't wanted to put it down. I've been carrying around Rachelle's book everywhere over the past few weeks. The book is exquisite. I just like to hold it and flip through the pages and admire the gorgeous photos. In addition to being a seriously beautiful book, Tinkerlab: A Hands-On Guide for Little Inventors is the manual for encouraging creativity that ALL parents should have on their bookshelf. Today I am excited to share with you a bit about Rachelle's NEW book! I am also going to tell you about one of the activities in the book that we got to try out. I have known Rachelle for over three years as I have followed the growth of her blog Tinkerlab. I have also participated in some of her creative challenges with some blogging friends and have been thoroughly inspired! I was so excited to hear that she was publishing a book and I was even more excited to be invited to participate in the Tinkerlab Blog Tour! I couldn't say yes fast enough!! Tinkerlab: A Hands-On Guide for Little Inventors is filled with 55 playful experiments that encourage tinkering, curiosity, and creative thinking. The activities in Tinkerlab are suited for kids of all ages (I love them just as much as my kids do), but are primarily created for kids ages 0-6. The book was written as a resource for parents and teachers who want to raise creative, independent thinkers. Tinkerlab is easy to use and includes loads of advice from some amazing people within the field of early childhood education. As we flipped through Tinkerlab, we thought the Straw Rockets looked cool. My kids love activities that let them launch things around our house and I love activities that are easy and require little to no prep... this activity was all of the above. You can find the full straw rocket tutorial in Tinkerlab: A Hands-On Guide for Little Inventors along with other ideas for how to experiment with them. Earlier this week I set up an invitation to create straw rockets for my 3-year-old and 6-year-old following the advice from Tinkerlab. I showed the kids how to roll the paper loosely around the straw and tape the paper in place. Then I showed them how to make a cone shaped nose for their rocket. They enjoyed tinkering around and ultimately decided to just create simple triangle noses for their rockets instead of cones. Then they put the rocket on the straw and blew it high into the air! The activity took us less than a few minutes to set up... but the creating and experimenting lasted much longer! It was so cool to see the wheels turning in their heads as they explored and experimented. 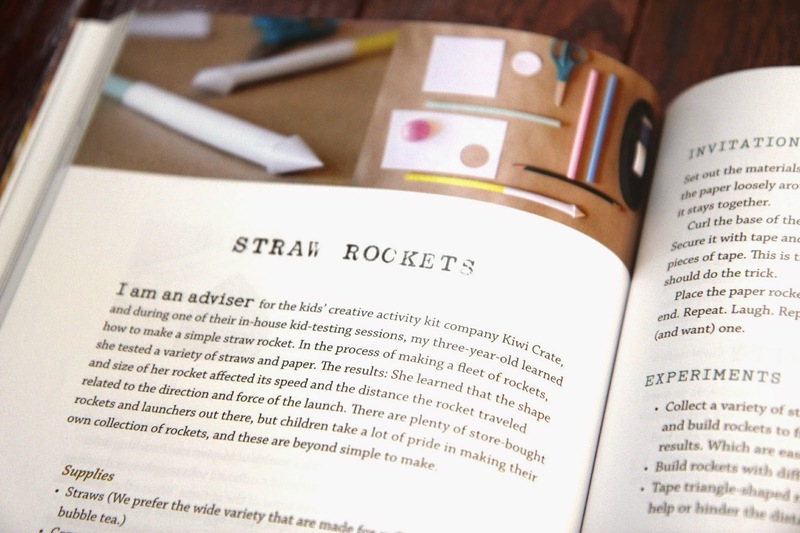 The straw rockets are just one of 55 awesome activity ideas packed into Rachelle's book. I am excited to try out even more of the activities starting next week once school is out! If you have a child under age 6 (or even a little older), grab a copy of this book. It would be perfect to have on your shelf or to purchase as a gift for someone you love that is raising little inventors. If you purchase the book I'd love to hear about your favorite activities or the sections that have been the most useful to you. I have already added "Create a Tinkerlab" to our summer to-do list and I am having fun collecting some tools for tinkering. I hope you'll join me! Thanks so much Tinkerlab for the opportunity to participate in your Blog Tour! Congrats on the launch of your new book! Everyone make sure to stop by and see who is participating in the Tinkerlab Blog Tour tomorrow! The blog tour line up is awesome and there are even some giveaways and awesome prizes. This looks fun!! I too love to expose my children to new ideas, but I hate having too much prep time (because I don't have it!). These straw rockets look like a blast. Thanks for sharing!! Is this book available digitally? So I can have it on my phone? This is such an ingenious, fun and simple idea that could lead to hours of fun. Art and craft activities are so helpful as a means of introducing problem solving and creativity into young children at an age when it can actually help form their own image of themselves and encourage confidence. This would make a great icebreaker team building activity for the children.